also be served as dessert, because they are so decadent. 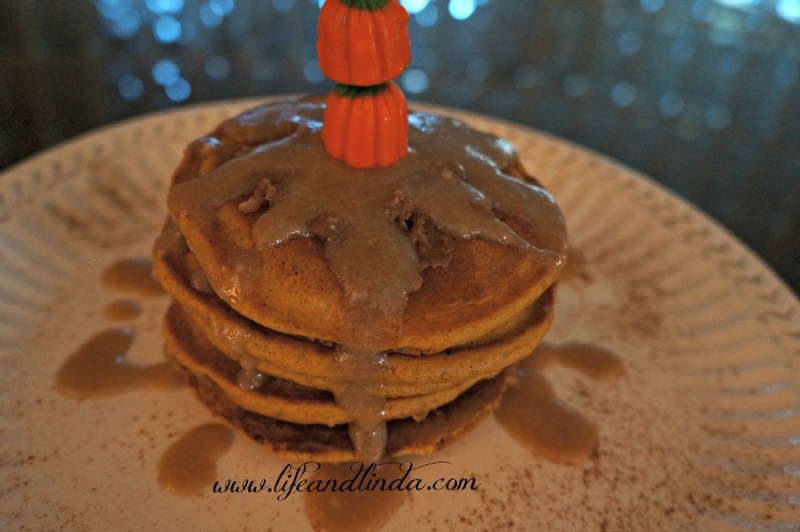 Being Fall in all, it's the perfect time of year to make these yummy pancakes. I have been thinking about pumpkin for quite some time now. mixture in the microwave for a few minutes. cinnamon, and butter. Mix together with your hands or fork until crumbly. 3. In a medium bowl, whisk together milk, egg, pumpkin, canola oil, and vanilla extract. Add wet ingredients to the flour mixture and whisk until combined. 4. Heat a griddle or pan to medium low. Coat with cooking spray. Drop 1/3 cup of the batter onto heated pan. Add 1-2 tablespoons of the streusel mixture. Cook on the first side until bubbles begin to form, about 2-3 minutes. Carefully flip pancake over and cook for another 2 minutes. Serve Pancakes warm with the cream cheese mixture or maple syrup and enjoy! Linda, these look delicious! I'm all about anything pumpkin right now! 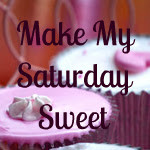 Hope you're having a great weekend! Hi Linda, oh my, they look , yummy, thanks for sharing. Ble swings Francine. 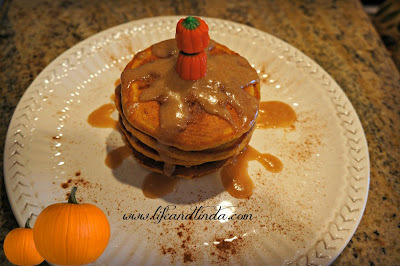 Love the thought of Pumpkin Pancakes! Yummy! Yummy and so festive! I'm sure they smell wonderful as they are cooking! Wow, those look delicious, Linda. I have never thought of pumpkin pancakes before. Thanks for the inspiration. Oh Linda this sounds so divine! I'll be right there!! Your pancakes look so good. I made something similar for my kids last weekend. I bet they'd love it next time with the streusel. What a yummy breakfast treat, Linda!!! thank you for stopping by and leaving a comment! really appreciate it! They look and sound delicious! I wish I had some right now. Thanks so much for stopping by. I really like your header. Great ideas for Halloween and fall decorating. I agree your header is really cute. And woo-hoo my friend connectto google is finally working again! Thanks for popping in to 34th street! This recipe is pretty amazing! Your place looks like fun! OMGosh! Are there any leftovers? 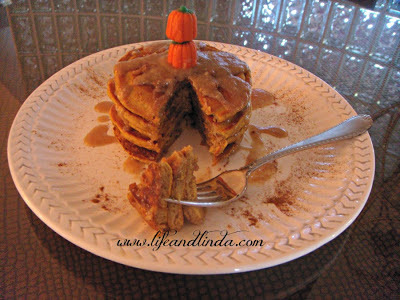 I LOVE pumpkin pancakes, and can't wait to try your recipe, especially with the maple cream cheese topping and the streusel. Thanks for visiting my post and leaving such a sweet comment. Yummy! 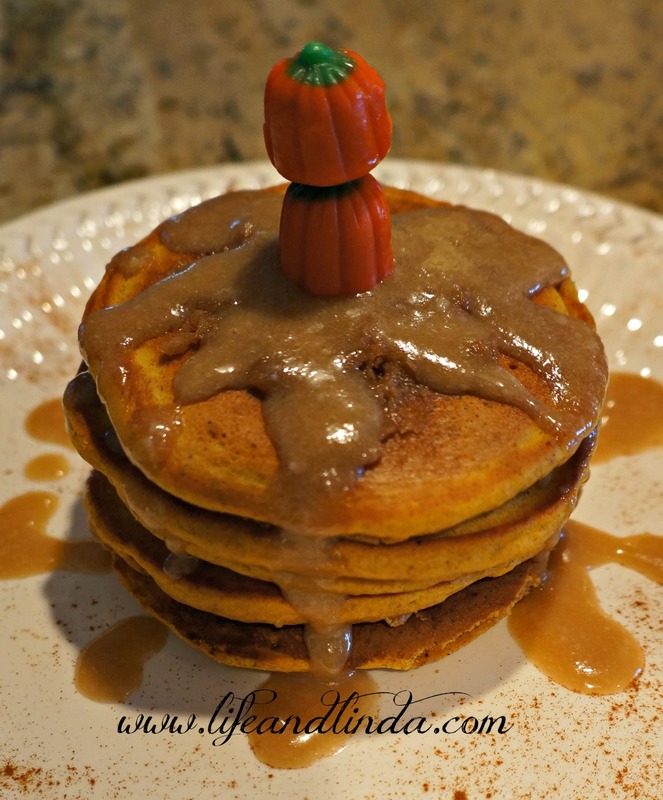 These sound really good and perfect for our cooler fall mornings.